Inspired by the timeless persona of Grace Jones, award-winning artist Rachael Young imagines a different future for women of colour through striking intergalactic imagery and visceral live music. Named after Grace Jones’ 1981 landmark album of the same name, NIGHTCLUBBING was originally sparked by an event in 2015 when a group of young black women were racially discriminated against and refused entry to a London nightclub. Embracing Afrofuturism, the cultural aesthetic behind the blockbuster hit Black Panther, which combines elements of science fiction, magical realism and African history, NIGHTCLUBBING reflects on the current progress and challenges around struggles for gender and racial equality. 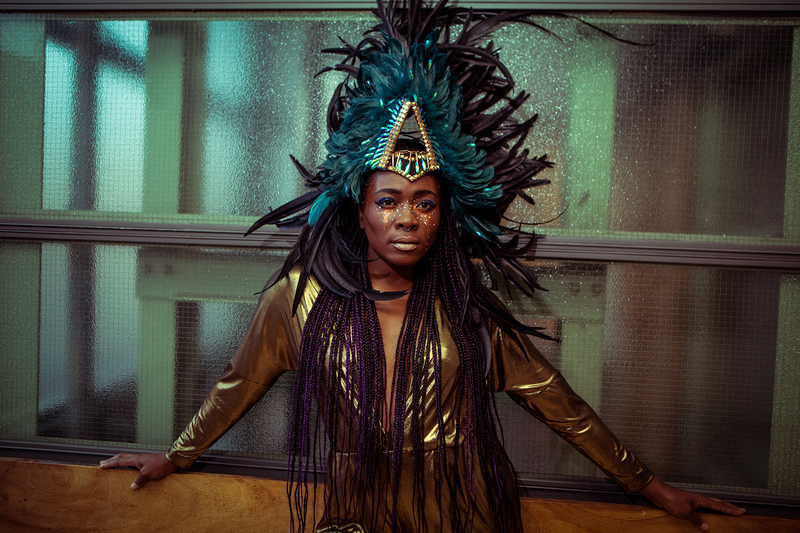 With an intersectional approach to feminism, where the multiple oppressions faced by trans women, disabled women, women of colour and black women are recognised, Rachael has worked with, and will be joined onstage by leading LGBTQ musicians to create sounds inspired by the Nightclubbing album itself. Rachael Young is an award-winning artist working across theatre, live art and socially engaged projects. Her practice responds to autobiographical experiences and socio-political landscapes, often connecting with communities who are underrepresented in the arts. Rachael’s current work explores political resistance and the relentless fight against oppression.